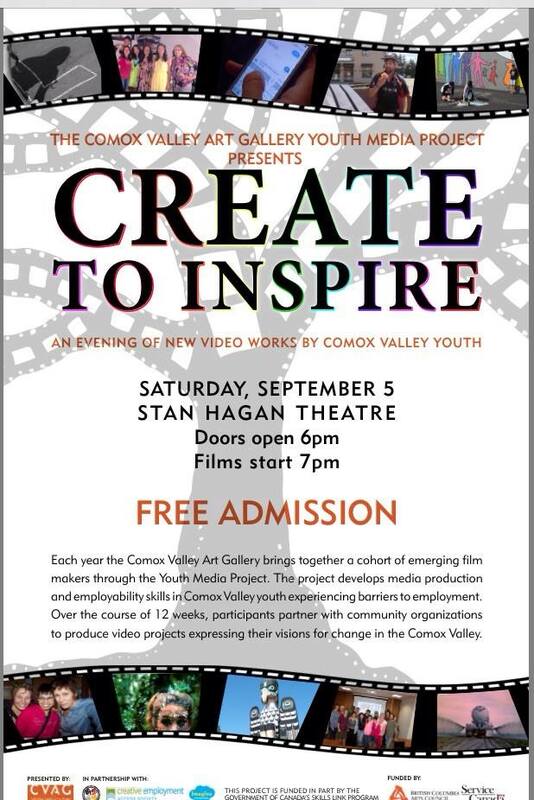 Each year the Comox Valley Art Gallery brings together a cohort of emerging filmmakers through the Youth Media Project. Participants engage in creating independent films that express their visions for change in the Comox Valley. Current work explores themes such as managing human waste, the real meaning of diversity, the affects of cyber bullying, the story of the Lewis Park totem poles, the importance of protecting the Cumberland forest, the meaning of love, and the story of a small town in Columbia that creates something out of nothing. Students work with community organizations to create short promo videos that will be screened as well. Refreshments will be served prior to the screening at 6:00pm when doors open.